As a young person, I used to think that it would be so awesome to be a celebrity. The fame, fortune, adoration, and special treatment sounded like heaven. Then I realized that celebrity is fleeting, sometimes more quickly than others. 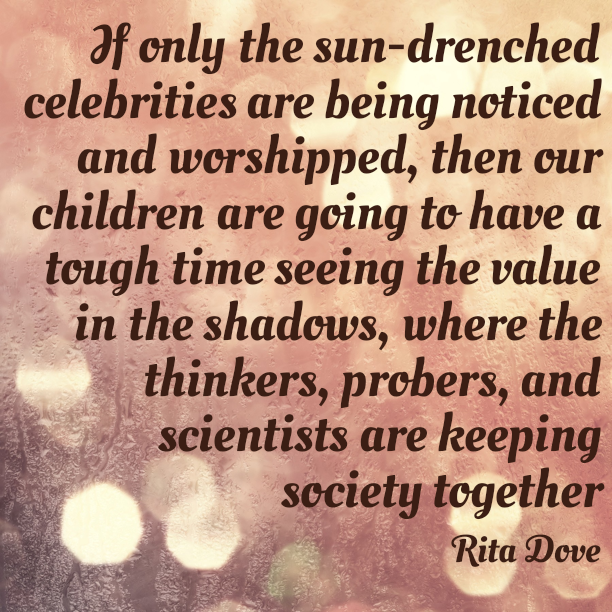 And the value of those in the shadows keeping everything together – think of the quiet leaders, scientific innovators, philosophers, thinkers, teachers – are immeasurable and timeless. I’d like to be remembered as one of those instead. Hope your weekend is dry. It looks like we’ll be bracing for some high winds and rain. Tonight I go through the yard and pick up any items that may fly away, i.e. Plant pots, bamboo sticks, wind chimes, etc. I have enough supplies – water, food, dog/cat food – that we will be fine. And I have enough gas for the car. Now, we wait. It’s not like I haven’t done this before.